The Women's Travel Group – Age and Travel: Who is Too Old? Home India travel Age and Travel: Who is Too Old? Age and Travel: Who is Too Old? 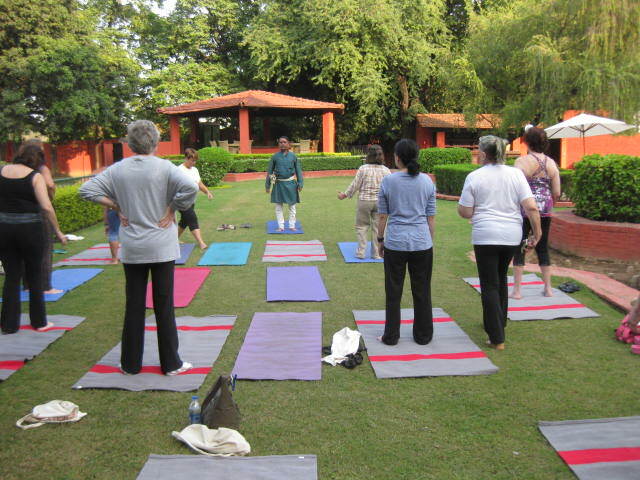 Gentle Yoga in India October 2014. Some watched and some stretched. We were asked this week does The Women’s Travel Group have an age limit on the upper end. As you know, we have women from 30-???. What are the health standards to not just come but come and have fun? ++ Did you ask The Women’s Travel Group about distances of walking, driving etc on the itinerary you like? ++ Are you mobile in your daily life? Can you handle steps without a bannister? If not well balanced, are you not self conscious about asking one of us to hold your arm? If yes, to either of these, you will be fine. ++ If you move slowly in the AM (not always age related), are you organized and ready to be on time even if you have to set your clock a few minutes earlier? ++ Can you work out your medicine needs in other time zones and without angsting and has your doctor given you a good supply of preventatives? ++ Can you tolerate long bus rides in places like India where we do have 1-2 longish days? ++ Are you comfortable coming alone as friends say you are nuts? Always feel free to call us and ask specifically if a trip will be appropriate for you. So who has been our oldest traveler? Not telling, but upwards of 80+. And will our insurance will cover all ages, don’t worry about that either. The answer is yes. Travel Tip and Encouragement from The Women’s Travel Group, shortly off to France and Italy in May!